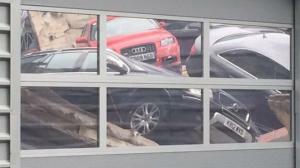 The full extent of the damage done when the roof of a car dealership in Milton Keynes collapsed has been revealed. On 1 June The Jardine Motors Group Audi dealership made the headlines when its roof, which was used to store vehicles, collapsed into the main showroom. At first it was thought between 10 and 20 cars were damaged in the incident but it has since been revealed that 34 cars were damaged. The company has said that it is still waiting for its motor trade insurance provider to complete an investigation into the event to assess how it happened before compensation can be awarded. While thankfully no one was injured by the collapse, the BBC has reported that six of the damaged vehicles belonged to customers – the remaining 28 belonged to the Jardine Motors Group. Tens of thousands of pounds worth of damage was done to the cars alone in the incident, not including the repair work that will be required for the premises. The roof of the dealership was accessible by a ramp to the rear of the building and it was used to store extra cars above the repair workshop. Jardine Motors Group stated that at the time of its collapse the weight of the cars on the roof was still well below the limit. The company's commercial director Jason Cranswick said: "The understanding demonstrated by our customers has been overwhelming, really." He added that the dealership and garage reopened on 15 June and that the customers whose cars had been damaged were given courtesy cars.